Those annoying video ads? The ones that play before what you actually want to watch? Turns out that premium placement doesn't always work the way advertisers would want it to. 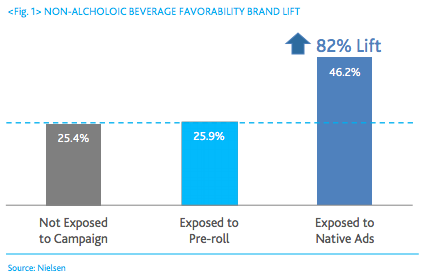 Native video ads drive higher brand lift than pre-roll. That's the idea behind a recent Nielsen report. Turns out if you click on a video because you thought it looked interesting, you're more likely to associate it positively with the brand involved than you’ll think positively about the brand that made it. Case in point, the brand video above involving a lucha libre and Jarritos, a popular Mexican soda. If the ad simply showed up as a 15- or 30-second pre-roll ad, autoplaying before a video you were waiting to watch, the ad drove littler to no brand lift. In fact, users measured in the study were more likely to respond to the brand survey negatively. For all those brands plowing millions into YouTube’s Trueview pre-roll product and similarly annoying autoplay video ads, our Lucha libre wrestler friend and Nielsen’s research provides a cautionary tale. The research backs up a simple idea: the more annoying and interruptive advertising is, the less effective it is. And the more user-friendly – aka integrated into a web site or app feed – the more effective. Where the research leads from a marketing effectiveness perspective is that all those views of YouTube videos that advertisers are buying as pre-roll could actually be delivering a negative value. 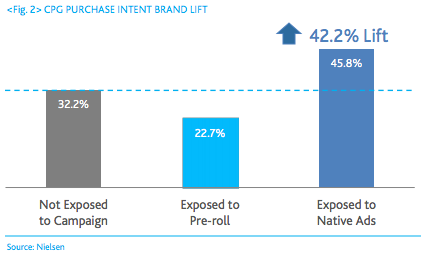 With Nielsen indicating that native ads perform nearly twice as well (82%) compared to pre-roll for brand favorability and 42% better when it comes to purchase intent, the research gives a nod to the relative effectiveness of native ads. Respect the user and you shall be rewarded.